FSX@War vient de rendre dispo pour FSX et P3D un module qui permet en autre de creer des convois a attaquer quand on a le TacPack, mais surtout, et sans avoir le TacPack, de synchroniser en multi le PA et meme la possibilite de spawner dessus. Ce n'est que le premier module un autre devrait suivre avec la possibilite si j'ai bien compris de creer un champ de bataille voire me;me une campagne dans n'importe qu'elle region du monde avec de l'opposition en face. le lien vers le Torrent en dessous. Voici la nouvelle version de DCS : Black Shark disponible chez Eagle Dynamics. 2 version de disponible : la mise à jour à partir de DCS : Black Shark, ou en version complète. 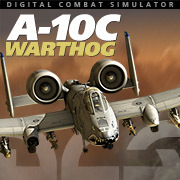 DCS : Black Shark 2 intègre tout ce qu'on peut trouver dans DCS : A-10C Wathog, et donc la compatibilité multijoueur entre les 2 titres. Aller, une nouvelle ne venant pas seule, je vous invite à voir quelques screen de l'avancé de la map Nevada sur le forum d'Eagle Dynamics. À voir la tronche des screens, je me demande s'il va vraiment pas falloir tarder à trouver des sous pour investir dans une nouvelle machine... C'est qu'il y a l'air d'avoir du monde là dessous ! Aller, c'est juste un pré change log, soumis à modification. Par contre pas de nouvelles concernant le patch de compatibilité avec DCS : KA-50 Black Shark. • Moving and changing cirrus clouds. • Increased the destruction values of buildings. A big and concrete buildings will require more bombs for destruction. For example: a big 16-floor building now requires two Mk-84 rather one Mk-82, as it was earlier. The same holds true for the hardened Command Center and Ammo Depot. • Added new, higher resolution textures for some buildings: TV tower and Control Tower by Mustang. • New CBU-97 and CBU-105 animations. • Fixed: RWR symbology intensity knob is now functional. • TGP North arrow follows TGP view when overflying the tracked target now. • TGP Autolase symbology has been improved - a steady/flashing ‘A’ indicator near the laser code on the TGP (autolase conditions are not met if flashing). ‘TGP AUTOLASE FAIL’ and ‘LASER CODE MISMATCH’ WCNs also implemented. • Fixed the GUN READY light logic - the light will be ON only when the gun is really ready to fire (i.e. no more ON while taxiing or taking off); Ground Safety Override Switch will set the light to ON. • GND SAFE and LDG GEAR annunciations on HUD/DSMS will work correctly now with the Ground Safety Override Switch. • Training mavericks are displayed now in SADL PPLI weapons status on the TAD. • Force Feedback stick shaker function have been adjusted. • Waypoints names set via the ME are now not auto-renamed upon complete CDU reinitialization via DTSUPLD. • The TGP compass rose is not displayed now if TGP LOS is above the horizon line. • If the Boat switch on Thrustmaster Warthog is moved to another position with TGP not being SOI, the TGP will update its polarity according to the new switch position once it is made SOI. • Missing PPLI voice callsign on the TAD is fixed. • ILS frequency display on CDU FLDINFO page is updated. If an airfield has different ILS frequencies for two of its landing directions, both frequencies will be displayed. Each under the respective runway number. • TGP A-G/A-A CTRL pages OSB mapping was updated - auto/man gain calibration, focus reset, and latch functions were enabled on these pages. • 'NO SPI' and 'TEST' messages were added for IAM station status on DSMS page. • Updated the TAD hook elevation display. It will be yellow when no elevation is available - the elevation is derived from the current steerpoint in this case. It will be displayed in red ‘NO EL’ when the hook becomes steerpoint. • Fixed VHF presets when the Mode Selector on the VHF panel was switched from OFF to DF and then to TR (in that order). • CDU longitude data entry routine is fixed - there were problems with sign when the data was entered without a hemisphere. • It will be possible to drop IAMs with CICU and EGI turned off. They will be released as conventional free fall bombs. • Coordinates format, yardstick type, coordinates, and laser designator mode (L/P/B) are now removed from the TGP display when the laser is in Laser Spot Search or Detect modes. • COPY FAIL and TGP SLV STPT INV notes have been implemented. • Various fixes to TGP LSS mode logic - laser spot loss, timeouts, displays transitions, etc..
• Laser mode on TGP AG page can no longer be changed while the laser is fired. • LSS and laser mode toggle function should now work correctly with TGP slaved to SPI. • TGP will no longer track moving objects if LOS is obscured. • Releasing an IAM will now generate Mark Z. • Signal Lights Switch and Approach Indexer & AR Status Lights Switch were made functional. • INR-A and INR-P are displayed instead of AREA and TRACK when TGP LOS is masked. • 'M' on the TGP will no longer flash. It is now visible only when LOS is actually masked. • System will not allow an invalid laser code to be entered. An invalid data entry results in a “CICU INPUT ERROR” on the scratchpad (CDU or HUD), and caution is displayed on the MFCDs (LASER TRACK CODE INVALID or LASER DES CODE INVALID). • Maverick symbology logic is slightly varied now with different IFFCC target elevation modes selected - DLZ and range cues have been removed from the display under particular slant ranges. • The IAM Quick Pickle routine has been updated. After the first quick pickle, the user has a chance to pickle again. After a 15 second timeout, the bomb will become unusable and it will be impossible to ‘restore’ the bomb via the DTS UPLOAD function. • Fixed the inoperable Auto EO power in multiplayer after multiple restarts of client aircraft. • ADI steering bar movement limits have been adjusted. • Fixed missing TER DETECTED and TER STORE DETECTED messages on the DSMS Inventory page. • IAMs are no longer initialized with ALN UNS or ALN GRDY status when a mission is started in-flight. • DSMS station status is correctly updated now when Selective Jettison is attempted with the RACK option. • Fixed the missing black background for some MFCD items. • HUD symbols are no longer shown outside the HUD frame. • Maverick FOV change is instant now and not a zoom. • Issues with ARC-186 and ARC-164 two lower digits frequency setting has been fixed. • TACAN frequency selector animation and functionality has been updated based according to real cockpit videos. • Marker beacon Morse code audio volume is no longer affected by the ILS volume knob on Intercom panel. However, it can still be turned OFF by pushing the ILS volume knob. • New canopy open/close sounds have been added. • New Sidewinder growl sound has been added. • Canopy jettison/tear off sounds have been added. • Cockpit Master Caution sound, and warning tones have been made non-spatial (not dependent on pilot’s head position). • Sidewinder growl is no longer heard in external views. • TACAN and ILS Morse code audio frequencies have been changed to 1020 Hz for ILS, and to 1350 Hz for TACAN. • The Middle marker beacon Morse code audio frequency was changed to 1,300 Hz. The Outer marker audio has been updated to better reflect the real audio. • CCIP consent option no longer affects the AGM-65. • The Waypoint name is no longer changed when its coordinates or altitude have been edited. • The red smoke generator is now shown in DSMS. • IAM min/max range marks, and current range caret will no longer randomly jump around when SPI is generated by the TGP. • Pressure and Barometric altitudes are correctly displayed on CDU CADC page now. • GCAS 90-foot hardcall no longer needs EGI and CADC to function. • Minor changes to the ARC-164 Frequency Knobs logic according to newly available videos. • The ARC-164 preset channel frequency is now displayed only after the Status button has been pressed on the control panel. Also, minor changes in the indication have been made - display test, etc. • The NMSP UHF light has been fixed. • EGI in-flight alignment will no longer cause an error in the ownship position. EGI will switch to NAV automatically when the 30 seconds timeout is over, and after a certain alignment accuracy has been reached. • IAM ALN RDY and ALN DEG status messages will no longer generate LRU FAIL for IAMs on the STAT page. • Airfields will be initialized in the CDU with correct waypoint numbers on all clients in multiplayer. • The Fuel Quantity Indicator will now show current fuel quantity instead of zero at ramp start. • The DSMS Quick Look profile will now display the correct bomb laser code. • CCIP Gun Reticle PAC-1 now correctly stabilizes on the API pipper when the gun is loaded with Combat Mix (CM). • Existing markpoints are now removed from the TAD upon DTS Upload. • The Signal light lamp test function has been fixed - some lights were not lit with only battery power on, and some were not lit with AC power available. • Laser guided bombs can now be released without TGP on board. • Fixed incorrect target elevation when switching it from DTS to HOT. NAV points (51 and above) will no longer be updated with hot elevation. All DTSAS functions will be ceased if a DTSAS failure is detected. • Select MAV video (China Fwd Short) logic was adjusted. • Radio frequency selectors rotation speed was adjusted for more convenient use. • Fixed bomb release interval option in DSMS. This no longer as an effect on CBU-97. • Ripple release will now work correctly with unlimited weapons. • Fixed SPI reporting for AI aircraft - index number on TAD, display sequence, and update period. • Fixed wrong fuel display for TAD air PPLI symbols. • Cockpit switches sound is positioned correctly now. Updated other cockpit sound positions. • BDU-50/56LGB auto lase procedure was fixed. • Each action in the aircraft auto-start sequence is followed by a screen message now. • HARS is initialized with correct magnetic heading. • The TAD map will be displayed instead of NO NAV DATA once any position source is valid - either INS or GPS. • Fixes to CCIP CR - heading scale is removed in post designate mode, ‘3/9’ and ‘5 mil’ indication is reverted to ‘MAN REL’ once the solution is inside HUD FOV. • Rockets can now be fired in CCIP CR if they are selected after a bomb profile. • Weapon ripple/pairs release order was fixed - the wrong stations sequence when profile was deselected and then selected again, inability to ripple rockets from paired stations. • HSI selected course pointer is correctly initialized with course to the next steerpoint when the aircraft is started in air. • Waypoint attributes from ATTRIB page are now correctly applied to a newly created waypoint or markpoint. • Waypoint attributes are now correctly applied to ADI/HSI steering when the steerpoint altitude/coordinates, current fly-to DB, or current steerpoint number have been changed, or when the ANCHOR point has been set as the steering destination via the NMSP. • Many fixes have been made to the ADI steering bars logic. Pitch steering will work for the anchor point now. Pitch steering was improved and is less sensitive. Bank steering bar will properly steer to the course set via HSI. Bank steering pointer will no longer generate strange steering commands. • SCS point altitude is now derived from current steerpoint. • ADI pitch steering bar does not steer the aircraft into the ground anymore. The minimum steering altitude changed to 90 feet. • Course set display on ATTRIB page will refresh when FROM point has been changed. • Waypoints DB is no longer reset during CDU warm start. • NO SPI WCN will be set if the current SPI is steerpoint with no valid elevation set. • CDU will perform some actions after the aircraft has landed: 1) DTS download will be performed. 2) RER and CEP will be calculated with special RERCALC waypoint being created and set as the steerpoint. 3) CDU warm start will be performed, once the CDU download is complete. • Fixed blank waypoint display on CDU when new mark Z event is created. • Brightness/contrast effect for sensors (TGP and Maverick) has been made much more realistic looking. Ce site a été mis en ligne le vendredi 10 juin 2011, et il reste encore pas mal de boulot. Voilà pour le moment J'espère pouvoir faire tout cela cette semaine ou d'ici fin juin au plus tard. Concernant le thème graphique du site, j'ai pour le moment laisser mon imagination et mon inspiration prendre le pas sur le bon goût et vous ai pondu un thème très sombre. La partie "graphique" n'est pas mon fort, donc si vous connaissez des sites qui ont un aspect graphique qui vous plait, montrez les moi et j'essaierai de m'en inspirer.